The first rule of dividend investing (or at least it should be the first rule) is: If the yield is too good to be true, it probably is. In an article I wrote last May, I looked into the highest-yielding stocks on the UK FTSE All-Share and found that four names had trailing dividend yields more than twice the FTSE A/S then-average of 3.3%: Cable & Wireless Communications (14.1% yield), Man Group (11.1%), Cable & Wireless Worldwide (8.87%) and Thomas Cook (6.92%). These ultra-high yields were either implying the market's anticipation of a dividend cut or that the market was missing something really important about the company's prospects. The market is actually a really good predictor of forthcoming dividend cuts (the share price falls and drives the yield upward to unrealistic levels), so I cautioned dividend investors to stay away from those four ultra-high yielders unless they had a really compelling reason to think the market was wrong. Since that article was published, Man Group, C&W Worldwide and Thomas Cook have each announced changes to their dividend policy, and just this week insiders at Cable & Wireless Communications said the company was considering a dividend cut in the coming year. By no means am I taking a victory lap -- I never like to see a dividend cut since someone somewhere is depending on it to supplement their income -- but I wanted to reinforce the principle that an ultra-high dividend yield usually means the dividend is at risk. This is particularly true in a bull market -- if the company was performing well, the market should bid up the share price and drive down the yield closer to the market average. When that doesn't happen, it's time to get suspicious. If you're unsure if a yield is too high, try comparing it to the market average yield. In the U.S., my rule-of-thumb is to be wary of any yield 2.5x or higher than the S&P 500 average; in the U.K., any stock yielding more than 2x the FTSE All-Share average should be approached with caution. For example, the current average S&P 500 yield is 2%, so any U.S. stock yielding more than 5% today should raise the yellow flag. The equation for expected long-term returns from equities is = starting dividend yield + dividend growth rate +/- change in P/E (sometimes called re-rating). So if you buy a stock with an initial yield of 3%, expect the payout to grow at 7% annualized, and expect no change in the P/E, you can reasonably estimate that your long-term return from the investment will be 10%. Source: Aswath Damodaran data; rates are annualized. Great, but what does this mean? 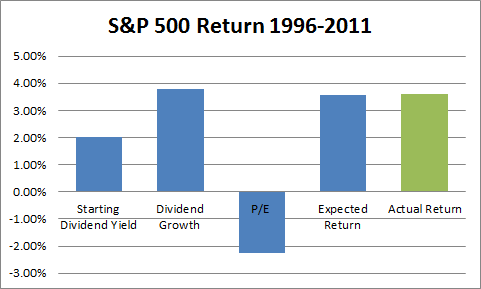 Keeping in mind the expected return equation of "dividend yield + dividend growth +/- PE change", if the current market is yielding 3% and average long-term market dividend growth rate is 5% (the S&P 500 annualized growth rate from 1960-2011) -- and assuming no re-rating -- the market's expected long-term return is 8%. If the stock you're researching in that same market has a yield of 14%, then, you need to be able to answer the variables for dividend growth and re-rating and why your expected return should be 600 basis points above the expected market return. There's probably a good reason for the discrepancy that can be explained through further research into the business. The odds are pretty strong that such a wide discrepancy will revert to the market average somehow -- and it's likely to come from a negative dividend growth rate. A meaningful decrease in the P/E ratio is unlikely because a stock trading with a 14% yield probably trades with a single-digit P/E to start with. So again, we're left with a negative outlook on the dividend growth rate. On the other hand, if you come across a stock yielding 5% in a 3% market, that's not quite as worrisome. It's possible, for example, that the long-term dividend growth rate will be 5% and -- assuming no re-rating -- the expected long term return will be 10%. It's much easier to find a stock that might be slightly underestimated by the market (in this case 100 basis points) than one that's being underestimated by 600 basis points. It's natural for income-minded investors to get interested in high-yielding stocks, but it's important not to get greedy. The investor's thinking is normally something like "Well, if the company can even maintain that 8% or 10% payout for a few years, it'll be a nice win for me." The market, however, rarely gives away such easy returns and that 8% or 10% yield is probably telling you that the market doesn't think the dividend is sustainable. All this is to say...never forget rule #1 of dividend investing -- if a yield is too high to be true, it probably is. NYU Professor Aswath Damodaran on how government nationalization might affect valuation (Musings on Markets).